The subject of advanced materials in catalysisbrings together recent advancements in materials synthesis and technologies to the design of novel and smart catalysts used in the field of catalysis. Nanomaterials in general show an important role in chemical processing as adsorbents, catalysts, catalyst supports and membranes, and form the basis of cutting-edge technology because of their unique structural and surface properties. 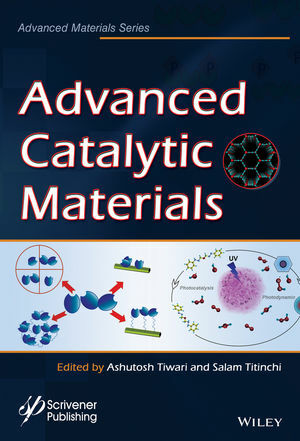 Advanced Catalytic Materials is written by a distinguished group of contributors and the chapters provide comprehensive coverage of the current literature, up-to-date overviews of all aspects of advanced materials in catalysis, and present the skills needed for designing and synthesizing advanced materials. The book also showcases many topics concerning the fast-developing area of materials for catalysis and their emerging applications. Salam Titinchi is a Senior Lecturer and Catalysis Research Group Leader at the Department of Chemistry, University of the Western Cape, Cape Town, South Africa. His research interests lie in the field of heterogeneous catalysis and coordination chemistry, and entail innovative designs for the synthesis of organic-inorganic materials for catalysis and coordination polymers, organometallic complexes, advanced nano-materials for environmental applications (carbon capture, water purification and green chemistry). He has published more than 50 articles and conference proceedings in the field of catalysis and has international research collaborations with Roskilde and Copenhagen Universities, Denmark, Johannes Gutenberg University, Germany, Missouri and Howard University, USA and the Norwegian University of Science and Technology, Norway.